Amidst the seemingly never ending debate on whether climate change is real or not, new readings of the Earth’s CO2 levels continue to show that it is real.Agencies that regularly monitor CO2 levels, like NASA, the Scripps Institution of Oceanography, and the Mauna Loa Observatory, have noticed that we have reached a crucial point. Usually, towards the end of September, CO2 levels reach their lowest point of the year — as plants grow and take in CO2 over the summer. 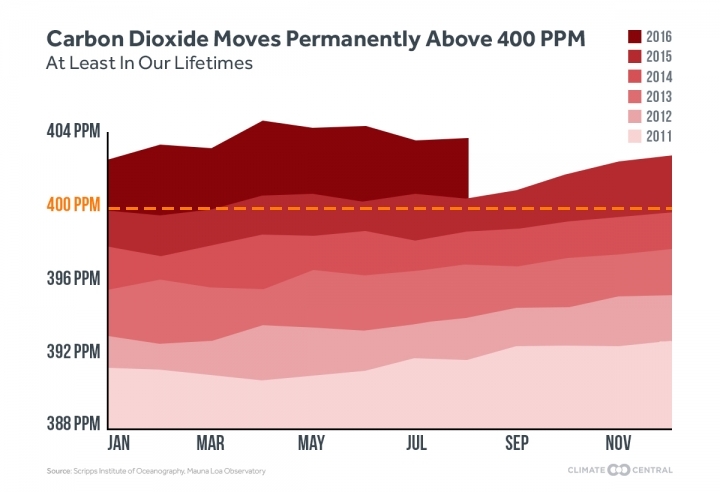 Except this time around, despite reaching counts comparatively lower then any for this year, CO2 levels have not gone below the 400 parts per million benchmark. Ever since man altered the levels of CO2 — thanks to the Industrial Revolution — to rates plants cannot cope up with, there has been a steady rise in CO2 levels warming the Earth about 1.8 F. And 2016 might be that time when we crossed another threshold, since we went past the safe 350 ppm levels. There is hope, of course, assuming we continue to take the necessary steps to counter the trend. It may take a decade or so, but, at the very least, we must try. If the Science is Sound, Why Do People Still Deny Man-Made Climate Change?